I promised I wouldn’t do it. But here it is. 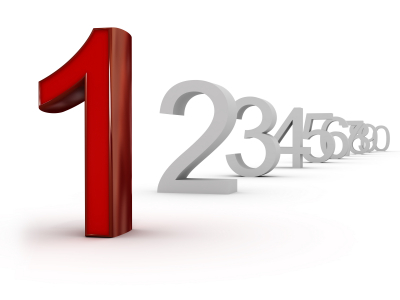 It is a bit like Groundhog Day – if it is May school rankings are out and the education community is screaming foul. And yet we do this dance over and over. 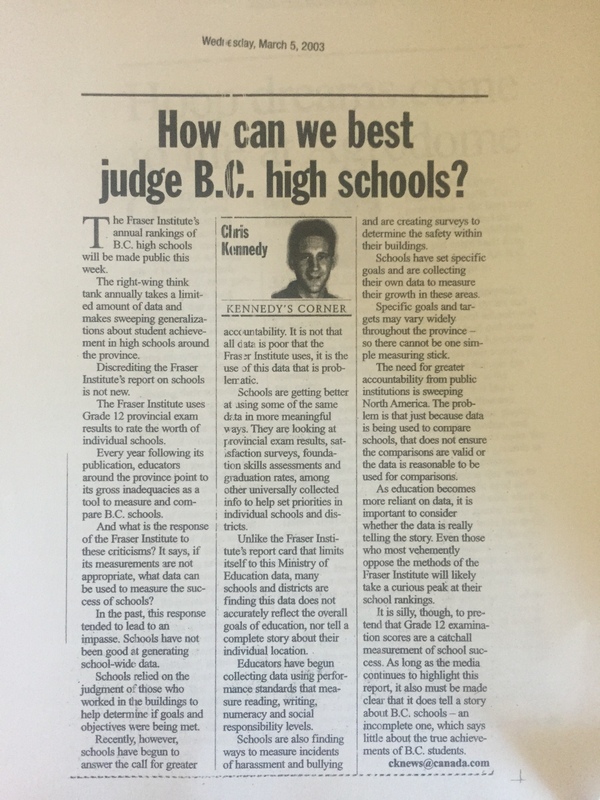 At a different time in my life I was a weekly columnist at the Richmond News, and here is one of many posts I wrote on school rankings – this one in 2003. I actually thought we had broken the cycle. School rankings have received far less attention in recent years, but this year, they seem to have had a resurgence. In so many ways, we have moved to a post-standardized world in British Columbia, further differentiating ourselves from many U.S. jurisdictions. We live in a world of increasing personalized learning and one less reliant on ranking and sorting. Some readers may have seen a recent front page article in the North Shore News about the annual Fraser Institute Elementary Report Card School Rankings, released in early May. Ecole Cedardale, one of our two French Immersion schools, was the only public school in the province to score top marks. While we are pleased with the result, the rankings provide only a small sliver of information about what our community values in schools. The Fraser Institute has been compiling data from Grade 4 and Grade 7 Foundation Skills Assessment to produce reports on student achievement, in an effort to help parents decide which schools perform best academically. They produce a similar report for high schools, based on the previous year’s average examination results in Grade 10, 11 and 12 courses that include a mandatory provincial exam. These reports reflect an old view of education: that we should compare schools and compete with one another. Our philosophy and success is based on a new model – that our schools are all connected, and should work together to improve. Collaboration — within districts, among districts and around the globe — is the key to building a stronger education system. 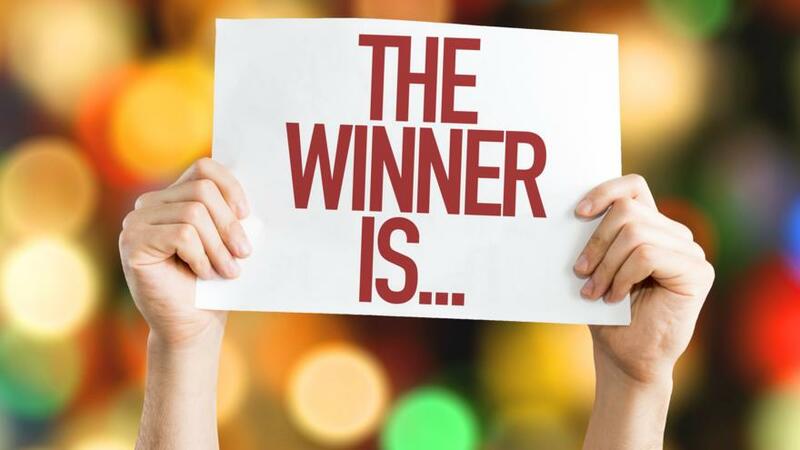 Student learning is not about labeling winners and losers. We appreciate the dilemma that a parent new to education — or new to a region — may be facing when they choose a school for their child, and know that it’s tempting to rely on a number in a complex world with so many choices. But educators know that using test scores to measure school performance is deeply flawed. It may provide some interesting insight at the student level, but beyond that, the measures tell us very little. It is just silly, for example, to look at one year’s scores and make broad generalizations about a school’s achievement. Cohorts of students are different each year – what is interesting to me is individual students’ progress over time. If there was one piece of valuable information I might glean from the data, it is the small gap between our highest and lowest performing schools. While individual school performance in the West Vancouver School District goes up and down year over year, the range in results in our district is the narrowest in Metro Vancouver. This year, for example, there is only a 2.4 point gap between the highest and lowest test scores. Given the consistency in data between our schools, and over time, the message that emerges is that all West Vancouver School District schools are consistently strong achieving schools on tests in core skill areas. So how does this link to selecting a school? The best choice for most families is the neighbourhood school. That is the choice my wife and I have made for our four kids. We know that the community connections and friends in the neighbourhood are good reasons to make a local school choice. That said, I know there is increasing choice for families. As you look at schools – whether for elementary or high school, please don’t decide based on a test score. Instead, we ask parents to visit our schools, meet with teachers, administrators and students, learn about the school’s unique programs and opportunities, and make a decision based on the right fit for their child. In West Vancouver, we offer a broad range of programs, and with strong academic performance well in hand from one end of the district to the other, we successfully focus on providing a broad range of educational and programming options that provide a richly woven learning experience for every child. It has been interesting to see some of the responses that I have got. People seem surprised that I would say anything, given the high standing of West Vancouver schools. It seems that I should take the approach that I am opposed to awards except for the ones we are winning. Let there be no mistake in what I am saying – we do have outstanding public schools in our district. And being a top performer in British Columbia in reading, writing, and numeracy is reassuring. I would be thrilled to have my own children in any of our schools. And core academics are very important – as important as ever. But schools are more complicated that simple rankings. I do recognize the irony that by writing posts like this I am actually giving more attention to the rankings that I am encouraging people to give less attention. So, I won’t blog about them again. I promise. And my offer stands – visit our schools. You will see students doing amazing work with reading, writing, and numeracy. You will also see students learning skills to be prepared for our world – a world rich in technology, where those who can work together, solve problems, and be lifelong learners will be the ones bound for success. This past week I had the opportunity to join Radio One’s On The Coast host, Stephen Quinn, and fellow panelists Ann Whiteaker, past president of the B.C. Confederation of Parent Advisory Councils; Jerry Li, Grade 11 student from Surrey, and Peter Cowley, Senior Vice-President of Operations and Director of School Performance Studies at the Fraser Institute, in looking at the state of public education in BC. The forum, which was hosted at Vancouver Technical Secondary School in Vancouver, used the tagline “Is BC’s Public Education System Broken?” Unfortunate, because while I do appreciate the question makes good media sense, it is not a productive starting place for a conversation about what we need to do to improve upon one of the world’s top public education systems. I would have liked more of a chance to explore the system we want, to have engaged on how to keep it moving forward, and to discuss what a greater focus on the pedagogy and practice that will be required for schooling in our future world would look like. However, the forum did highlight the passion of those who work and participate in the public education system in British Columbia. Hopefully, there will be more public input and conversations soon (and more listening to the voices of young people!) focussing on the learning our kids need and the education system this will require. The forum podcast is available here (the forum was held in hours two and three, though there is a good interview with the Ministry of Education’s Superintendent of Achievement, Rod Allen, in hour one). There were also active, and good conversations on Twitter, which one can still find by searching #otcforum. Several thoughtful reflections on the event have also been received, including this one from Jenny Arntzen. The greatest strength in BC is our consistent, high levels of achievement; we do really well for most kids – from graduation rates to international assessments – we are one of the top performing jurisdictions in the world. Educators from around the globe flock to BC to learn our secrets, and international students, for example, see our schools as highly desirable. We have an incredibly diverse clientele, far more diverse now than even 10 years ago; we have been challenged by funding, yet our achievement levels have continued to improve. And at its core, this is all about outstanding teachers and administrators – highly-skilled, dedicated, passionate teachers investigating new ways – embracing technology, and giving so much to the life of the school from athletics to the arts. There is nothing more important than the connection teachers make to students and we get that right. There is a total commitment to doing the right thing for every student – it is very impressive. The system is not broken. Ironically, this strength is also a weakness. It is hard to transform a system that is highly successful – why change when we are doing well? We have to come to grips with the understanding that while it may be reassuring for our kids’ schooling to look a lot like our schooling looked like, this will not prepare our kids for the world that we are in and they are entering. We need to transform the system to a new place – more of just the same is not going to make us better; we need to connect and network the brilliant pockets of innovations blossoming around the province. We need to address the increasing relevance and engagement gap for kids – particularly as students move to high school – kids tell us their engagement is waning. We need to ensure the system is reflective of the world we live in with an increased focus on skills and competencies, real world learning and less content focussed. We need to better figure out how to meet the needs of students that don’t see university as their first option after Grade 12. To be very clear, we are in this transformation from a position of huge strength – becoming a better version of us. Hopefully, this is the first of many opportunities this year to move conversations about public education in BC to the mainstream.